Ruidoso Downs Badge - New Mexico, home to the richest quarter horse race in the world... The Two Million All American Futurity. In 1947, the first race was run at Ruidoso Downs (known as Hollywood Park until 1953). The facility was a far cry from the grand site seen off Highway 70 today. This solid metal two tone badge is a stunning silver tone shield with antique gold tone sculptured centerpiece and ribbons and is the current duty badge worn by the Ruidoso Downs Police Department. This badge is made from a custom die designed for the Ruidoso Downs Police Department and made to the highest quality industry standard you've come to expect from Lawman Badge. 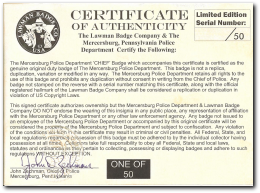 All Certificates of Authenticity are hand signed by Chief Robert Denny of Ruidoso Downs Police Department, New Mexico. Don't miss out on this special opportunity to own one of these special and unique badges we are fortunate to offer to collectors from the HISTORIC SITE OF THE TWO MILLION ALL AMERICAN FUTURITY.